For those who don’t know, when The Flintstones was first broadcast in 1960 it was a prime-time show aimed at adults, like The Simpsons is today. 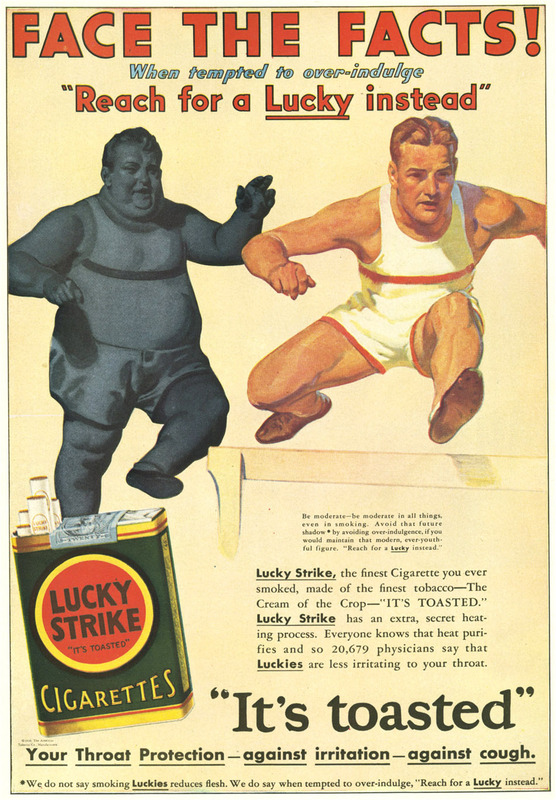 As was typical of the time, the show had one main sponsor and the characters would plug the sponsor’s product, in this case Winston cigarettes. While you could argue that it was an adult show so the ads were not aimed at children, the fact remains that children were a huge target of cigarette ads and using cartoon characters to push cigarettes was a broadside fired squarely at kids. Cartoons were not the only children’s medium used to sell tobacco to kids. 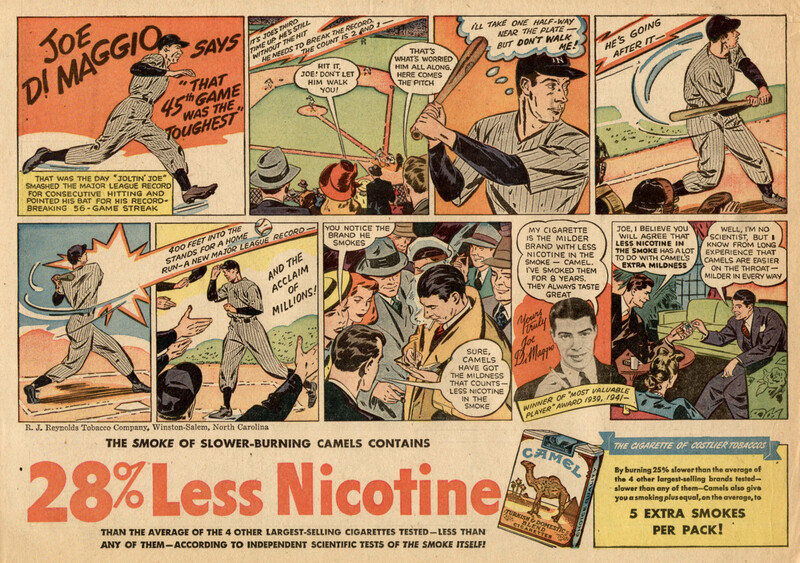 Comics were big areas of interest to Big Tobacco. Baseball, a sports hero, and a comic strip. That pitch is aimed straight at the meaty part of the plate. I find that reprehensible, though I grudgingly admit the genius of that ad. Read it again but pay attention to what it doesn’t say, only what it implies. Nowhere does it say that smoking Camels made Joe DiMaggio a super athlete, but look at the actual photograph, with Joe talking about how he has smoked them for eight years, with his MVP award mentioned very conspicuously right below the smoking cigarette. What conclusion is a young kid reading a comic book supposed to reach? And notice the big “5 extra smokes in every pack.” You must get five more cigarettes in each pack, right? No, not really, read the fine print. And what kid does that? What about the claim of 28% less nicotine? According to that ad, it is the smoke that contains less nicotine! That’s the part you exhale, not inhale. “Well, I’m no scientist, but I know” that claim says nothing about the nicotine in the cigarette itself and nothing about what you are inhaling. Camels strike again. A comic, a test pilot, a fighter plane, and a woman. Camel pulled out all the stops for this one, and tops it all off with the implied approval of the armed forces. Did you catch the blatant sexism too? “WHAT? 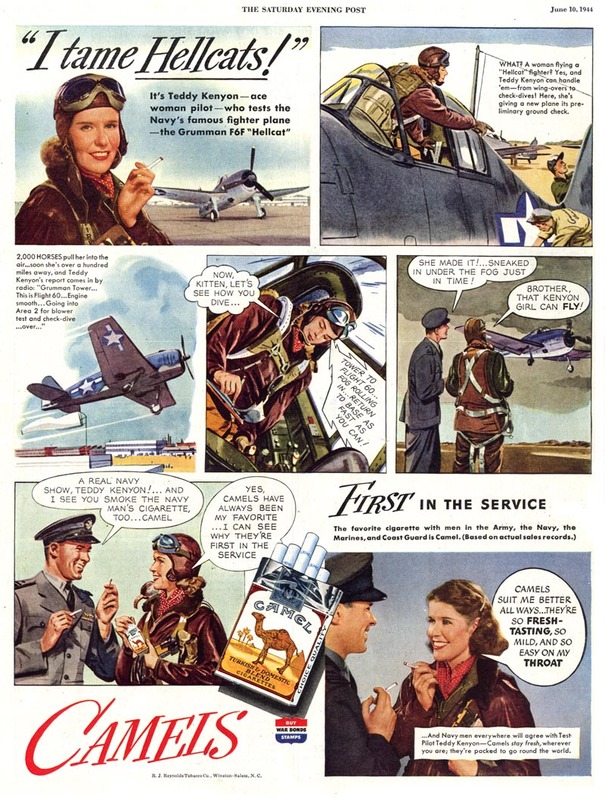 A woman flying a Hellcat fighter?” I know these have to be judged by the standards of the era, but there is a stunning lack of subtlety in these ads. If you can’t read the teeny tiny disclaimer at the bottom, it says “We do not say that smoking Luckies reduces flesh. we do say when tempted to overindulge, ‘Reach for a Lucky instead. '” No, they don’t say it, but “face the facts!” In all but words, that is what the ad is saying. I’ll end this as I began, with a pair of popular celebrities shilling smokes. These two were the focus of a Saturday Comics several weeks ago. 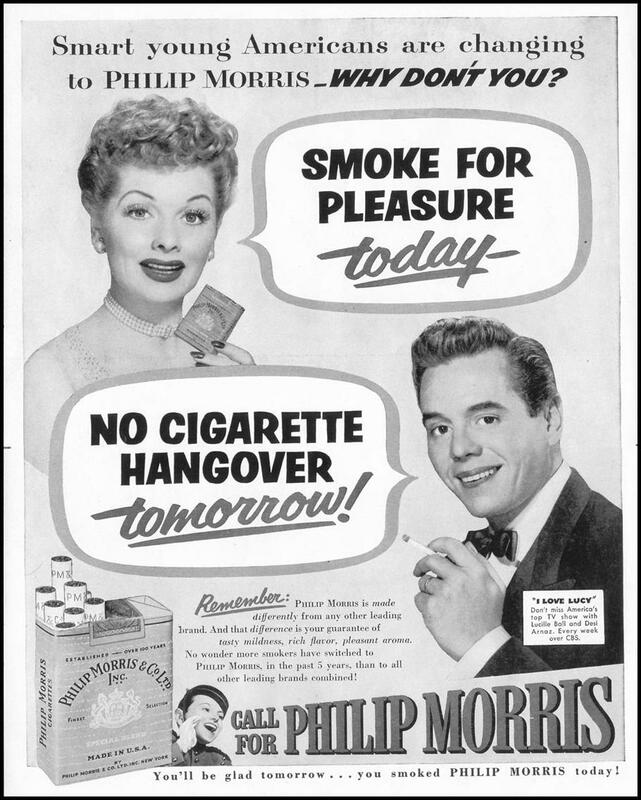 I love seeing old cigarette ads–they restore my hope that other crazy things will ultimately be revealed as, well, crazy with the passage of time. 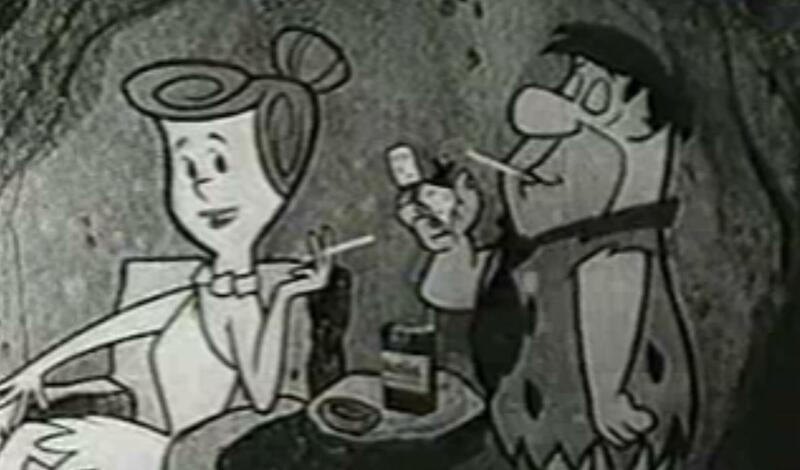 I’m sure that when I watched the Flintstones in my youth I was wreathed with my mother’s cigarette smoke and my fathers cigar or pipe smoke as we sat in our living room in front of the TV. I think that’s why I never became a smoker. My mother, father, and grandfather all smoked. Grandpa stopped when I was born and seeing him smoking in old photos is weird since I never knew him to smoke. Dad stopped cold turkey when I was young and I barely recall him smoking. Mom only stopped a few years ago. I never picked up the habit. I found other ways to satisfy my oral fixations. Snack foods. I may have a pot – belly, but at least I foresee no ( serious ) cardiopulmonary problems in my future. Back in the 30’s, 40’s & 50’s, not many studies were done about the harmful effects of tobacco. We also gave expectant mothers Thalidomide, & in the 20’s & 30’s, nothing was thought of prescribing opium, & cocaine was an ingredient in everything from ” patent medicines “, at least 1 Italian wine ( Vin Mariani ), & of course, Coca – Cola. They knew at the very least about the addictive nature and knew just what they were doing when they sent cigs to soldiers in the hospital. They knew any health benefits were total bull and while there may not have been long term studies they had more than enough info that smoking was harmful. OK, so they obviously can’t plead ignorance, regarding the addictive nature of cigarettes & other substances. The tobacco lobby had long arms back then. Creating future generations of addicts to keep a steady flow of long green….. Makes you proud to be an American. I’ve been staring at these words for minutes trying to think of a comment, but none came to me: it’s simply overwhelming. Humanity’s contempt for life and people’s abysmal stupidity is way beyond what I could find words for. 2011 is different, but in those days people weren’t educated about the dangers of smoking. I don’t have the words to say how disgusting those ads are.